Right now it’s interval in the Boxing Day’s Big Bash T20 match between Perth Scorchers v Melbourne. 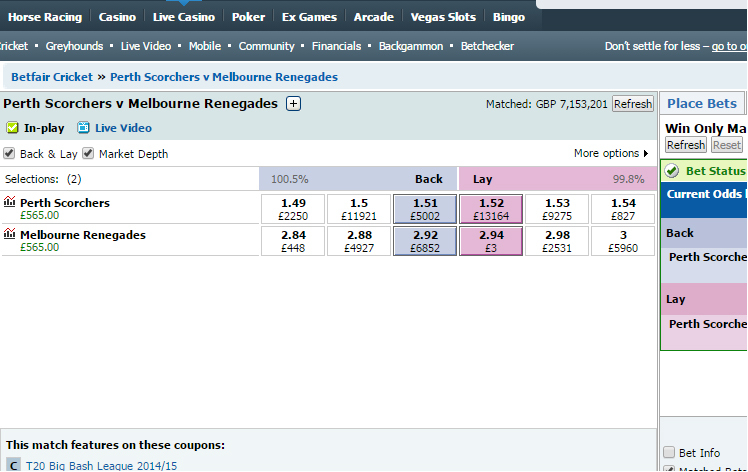 I managed to green up for a profit of £565 by trading at Betfair. There is no cashout available for Australian market so I’ve used BetTrader for trading. I’ve always predicted that Big Bash T20 matches are 50-50 match and it’s very difficult and risky to trade on these matches. On Australian pitches runs are hard to come by and there is not IPL style boom boom.